In a small, heat-resistant bowl, soak dried mushrooms in hot water for approx. 15 min. Finely chop shallots and garlic. Clean button and porcini mushrooms and cut into slices. Drain soaked mushrooms, make sure to keep the soaking liquid. In a saucepan, add two-thirds of the butter and sautée shallots and garlic until translucent. Add button mushrooms and dried mushrooms and continue sauteing for approx. 4 – 6min. Season with salt, pepper, and grated nutmeg. Pour in vegetable stock and most of the soaking liquid. Bring to a boil, turn down the heat, and let simmer for approx. 20 min. on low heat. Remove from heat and blend the soup with a hand blender. Whisk in heavy cream and egg yolks and season with lemon juice. Finely cut chives. In a frying pan, sauté porcini mushrooms in the remaining butter until cooked through. Add chives and season with salt and pepper. 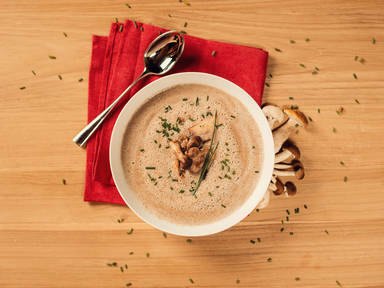 Transfer soup to a soup plate and add in porcini mushrooms. Serve with fresh bread.